Two thousand of Africa's increasingly rare hippo, living in the wildlife haven of Zambia’s Luangwa Valley, face the renewed threat of terror and death, following a meeting held in Lusaka on Wednesday 22nd June. Please contact Zambia’s President and Minister of Tourism politely calling for this 'temporary' halt to be permananet. Please write and start both letters ‘Your Excellency’ and sign off both ‘Yours respectfully and sincerely’. International and Zambian opposition to the cull has been widely reported in the media. A temporary suspension of the cull, announced on 14th June, was, according to the Department of National Parks and Wildlife (DNPW), to allow for “extensive consultation”. However, following the brief meeting in Lusaka on Wednesday 22nd June it now appears the hiatus is over and the cull is set to resume. This “invitation only” meeting was called by Stephen Mwansa, Permanent Secretary of the Ministry of Tourism & Arts, and Paul Zyambo, Director of DNPW. The company contracted by DNPW to carry out the cull, Mabwe Adventures, was in attendance, along with only one local stakeholder, the Luangwa Safari Association - representing safari camps and lodges in South Luangwa National Park. 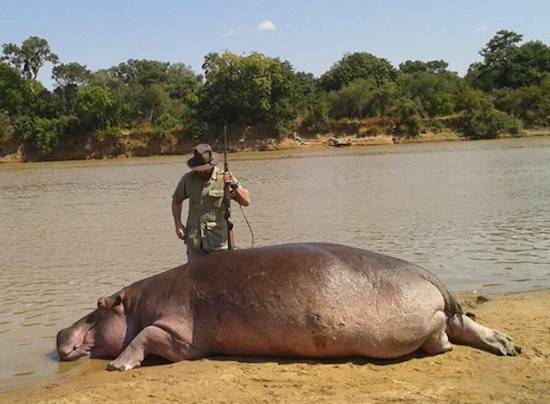 Information from Zambia indicates that DNPW is now poised to push ahead with the cull of 2,000 hippos over five years using paying trophy hunters, as was recently promoted on Theo De Marillac Safaris’ website. Why this decision has been taken, and on what basis, remains shrouded in secrecy. In light of this, Born Free Foundation wrote to the President of Zambia, His Excellency Edgar Chagwa Lungu, on 27th June, requesting the cull be abandoned and that key information pertaining to DNPW’s justifications for the cull to be made publically available. To date, no response has been forthcoming. DNPW has failed to provide categorical evidence that an approved and transparent tendering process took place in awarding the culling contract to Mabwe Adventures, of which an ex-Zambia Wildlife Authority employee, Flavian Mupemo, is a shareholder and beneficiary. Given the highly contentious nature of culling; the unanswered questions raised above; the possible conflict of interest; and the concerns about the lack of transparency of the tendering process, Born Free Foundation is calling for the planned cull to be abandoned and for the matter to be investigated at the highest possible level by an independent inquiry, established under the auspices of The Office of The President.